The rumored iTunes 9 was announced today at Apple's "It's Only Rock and Roll" media event. iTunes 9 brings multiple new features, including iPhone app organization, "Genius Mixes", expanded media syncing options, and much more. Genius Mixes is a new feature that leverages the Genius information gathered since the launch of this feature with iTunes 8 at last year's September media event. Genius Mixes can play an endless mix of songs from your iTunes library that "go great together." iTunes 9 will automatically generate 12 of these mixes by default, and more can be created by the user. Device syncing has also improved in the latest version of iTunes. Genres and artists can be selectively synchronized along with playlists, and photos can now be synced by Faces and Events. Home sharing is another new feature that allows iTunes media to be copied and shared among 5 authorized computers in the same household, with settings available to make copying new purchases automatically. All authorized computers are visible in iTunes in the Shared category in the Source list. 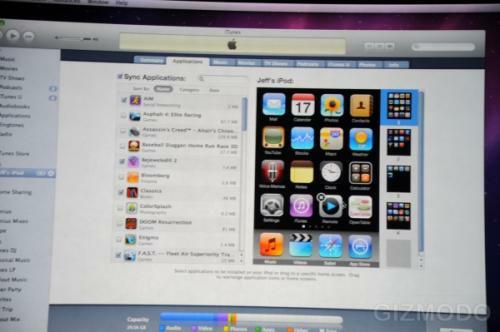 iTunes 9 includes the iPhone app organization feature that was previously rumored. Replicas of the home screen pages of a connected iPhone appear within the Applications tab where apps can be selected for syncing and removal and dragged and dropped to appear on the desired home screen page. Additionally, the iTunes store interface has been re-designed to allow for easier browsing and now offers iTunes LPs - albums with additional content such as lyrics, photos, liner notes, and more. Movies also get a bump from extra content through iTunes Extras that include additional features, graphical chapter selection, and more. Finally, Apple is now offering 30,000 pre-cut ringtones from major music labels, priced at $1.29 each. iTunes 9 is a free download and is now available.